Unlike 2011, conditions in Park City, Utah, this season have been unusually dry and warm. Saturday was no different, as temperatures in the low 90s and steady winds made it feel more like the desert than Park City. That didn’t keep riders from turning out for the second round of the Utah State Championship Series held at Round Valley on June 23, 2012. With close to 300 in attendance riders were treated to a blazing fast, challenging course that was heavy on singletrack. The pro fields started first with the men putting on a great show with over 20 riders in their field. After a fast start a lead group of 3 developed on the opening lap. Local rider Nick Fisher (Rooster’s/Bikers Edge) was joined at the front by out-of-towners Ben Aufderheide (The Hub) and South African youngster Brendon Davids (Sho-Air). Just behind the leaders sat Brent Pontius (Rooster’s/Bikers Edge), Geoff Montague, and Nate Miller. After the opening 8-mile lap Davids pushed the pace up the Backside trail starting off the second lap. The young South African opened up a slight lead of just 15-20 seconds over the two chasers. Now in control, Davids gauged his efforts keeping a close eye on the chasers while never letting them bridge the gap. On the final lap, Davids held the lead, still at about 20 seconds. Ben Aufderheide had taken over second with Nick Fisher in third just in front of teammate Pontius. With only seconds separating the top 4 riders lots of excitement was in store on the final lap. Brendon Davids climbs the steepest part of the Park City course ahead of Ben Aufderheide and Nick Fisher. Photo: Shannon Boffeli., mtbracenews.com. Davids had paced himself well throughout the first two laps and a continued, steady effort kept him out front. Aufderheide was not so lucky as the heat started to take a toll. Nick Fisher and Brent Pontius were slowly reeling in the rider from Wyoming. With less than a mile left Fisher caught the second placed rider and attacked with all he had left. In the end, the Sho-Air rider Brendon Davids took the win ahead of an exhausted Nick Fisher. Ben Aufderheide was able to hold off Pontius for third with Brent crossing the line just seconds behind. 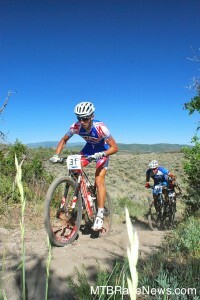 Park City rider Sam Sweetser (Cole Sport) moved through the pack all day crossing the line in fifth place. The women’s race proved every bit as exciting as the men’s. With National Ultra Endurance champion Amanda Carey making the trip down for the race. She would be challenged by locals Evelyn Dong (White Pine), Kathy Sherwin (Stan’s NoTubes Elite), and Jen Hanks (Epic Brewing/MTBRaceNews.com). 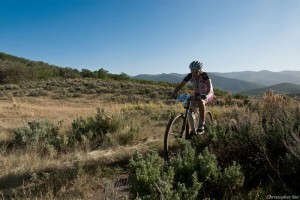 Off the start, Moots rider Jill Damman took the lead pulling the elite field toward the singletrack. Carey and Sherwin were the first to come around, followed closely by Evelyn Dong. Before finishing the first of three 8-mile circuits Carey had begun to slow allowing Sherwin and Dong to take up the front of the race. The two Park City riders continually challenged each other creating a tremendous pace and leaving Carey behind. KC Holley (4 Life) took up fourth spot with Kelsy Bingham (Jamis) just behind while a flat tire sent Jen Hanks all the way back to last place. Throughout the second and third laps Kathy Sherwin and Evelyn Dong traded places with each rider taking some time on the front. Neither was able to open a gap of more than a few seconds and with just a few miles of racing left the two leaders were wheel to wheel. Sherwin is dominant on the descents and she took a small gap into the final downhill sections leading to the finish. That was all she needed, as she kept a gap of just seconds into the finish. Evelyn Dong came in with a satisfying runner-up finish. Amanda Carey held off a hard charging Jen Hanks for third. Hanks recovered nicely from her early flat working her way back onto the podium. Kelsy Bingham finished fifth. Next race in the Utah State Championship Series comes July 21st with the Wasatch Back 50, a 50-mile mountain bike race in Midway, Utah. See results on page 8.